Four opened jars of jelly! Put Loose jars in tubs. Saves me lots of stress. so, when will you be here to organize my fridge? i’ll be waiting!! This is such a great idea! I hate to leave the fridge door open looking for things. I’m sure hubby will love this idea as well, he’s always nagging me about how disorganized I am. he’ll surprise me…hahahaha…he doesn’t believe in surprises!! oh well, there are other endearing qualities that i married him for! How did you know I have an empty clementine box lurking on the counter because it was too wonderful to simply throw away, yet too poky with big staples to let my kids play with it, just waiting for me to figure out its purpose in life? Great tip! 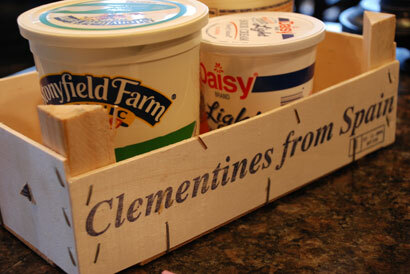 We use our clementine boxes to hold fruit. And I have bookmarked that contest – have to think of an idea! Great tips. Unfortunately, even being organized doesn’t help in my family. I’m always the only one that can find anything. I love the idea of using the box in your fridge! I’m always looking for neat new ways to organize things–it’s a sickness. Oh, did I mention that your banner is awesome? Your clementines come in boxes? Mine are just sold out of a big bin at the greengrocer’s (and the same at the regular supermarkets, but their quality is lower). I bought some this morning – just picked out as many as I wanted and put them in the ever-present plastic bag for weighing at the checkout. Of course our Clementines come in boxes!! I’m not up for hire… this fridge keeps me busy ENOUGH! I’m impressed! I just throw stuff in then quickly slam the door before it all falls out again! that’s freakin’ brilliant! no lie. Ohhhh…that’s a good idea. I saw something similiar, but they suggested putting all the items you use to make kid’s lunches together. Bread, meat, mayo, cheese, etc. Since my kids don’t go to school yet I haven’t had to do this, but it makes sense! Thank You … an awesome post on a brilliant idea, well done! That’s a good idea, might try that in my fridge. Cause…it’s a mess! A little Martha Stewart blog. I guess that’s a good thing. But what about the tubs of stuff you can’t identify? I keep my fishing worms in the fridge. I guess they will need their own Clementine Box. Very cute post. Amazing how much you can do with tubs and bins! That’s a very clever idea. Thanks for sharing it. Now I will know what the back of the fridge holds. What a good idea! Our fridge is always chaotic. I might have to try this. A haiku for any occassion! LOL This is such a unique twist on the theme. You rock! Tips by haiku – clever and the idea appears to be perfectly fine! Nice! great idea… tho that would require great discipline..
Rita Rudner talks about this in her Vegas comedy routine. 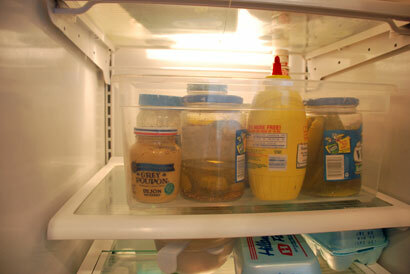 She calls it “Refrigerator Blindness”, and it’s typically a guy thing. They look for something in the fridge, and if it’s not right there, in front, waving at them when they open the door, then they can’t find it. They just stand there. They’ll even make the temperature of the kitchen go down ten degrees rather than move the milk. They just won’t do it. The plastic tubs that hold baby wipe refills fit perfectly in the door of my refrigerator. 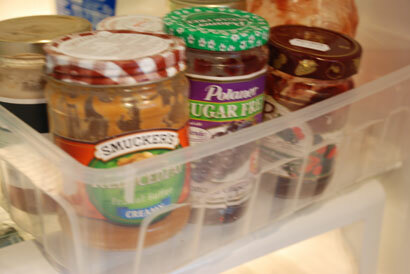 Not only are they great for organizing, but they also making cleaning the fridge a snap, since they catch all the spills and stickiness from the jar bottoms.